This 5 days tour has been specially created for all those people interested in knowing more about the south east of Mexico. A trip back in time to learn more about one of the greatest civilization ever: LOS MAYANS. Departure from Cancún to Chicanna. In route we visit the archaeological site of Tulum, perched on the coast of the Caribbean Sea and protected by a fortress wall and the second largest reef in the world. It is considered to be one of the last Mayan cities, their collapse were in 1600 AC. After this visit we will continue to the archaeological site of Kohunlich, to admire the great stucco masks, the ball court and the plaza of stelae. The last stop is the archaeological site of Chicanna, famous for temples with zoomorphic figures. Overnight in Chicanna. Departure from Chicanna to visit the archaeological site of Becan whose name in Maya means "cliff" probably because of the pit that surrounded the central part of the city at one time, after this we will go to the impressive waterfalls of Misol Ha where time for swimming will be given; in the afternoon we continue to Palenque for overnight. Visit to the archaeological site of Palenque, a place of mystery and magic hidden in the mountains of Chiapas. You will be astonished by temples and the ornate tomb of Pakal. We will continue to the city of Campeche, the beautiful Pirate City. Overnight in Campeche. Depart from Campeche to visit the archaeological site of Edzna, and its impressive buildings complete with acoustic curiosities! 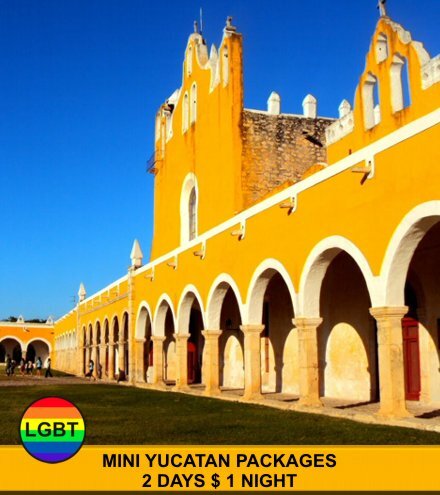 We continue to the state of Yucatán to visit Uxmal, one of the most romantic Mayan cities, known for its unusual rounded pyramid. Overnight in Merida. Depart from Merida to continue our visit to one of the Seven Wonders of the Modern World - Chichen Itza, a site where the Maya brought together their knowledge of the heavens to astonish us each spring and fall, as thousands gather at the equinoxes to watch the serpent formed by the sun descend the central pyramid. Continue to Cancun and/or Riviera Maya, for drop off in your hotel. $ 985.00 USD per person | Minimum two people | Price does not include food and beverage. - Guaranteed departures every day (reserve at least 7 days in advance). - Request a form of payment, we will contact you for additional information.